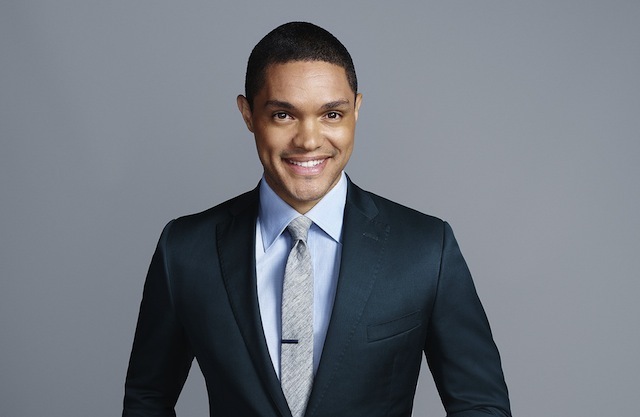 The Daily Show returned Monday night with much fanfare as South-African born Trevor Noah, 31, took the reins and filled the seat vacated by Jon Stewart – the “comedic father” everyone loved and adored. His first joke of the night was instituted by the fact that not only does the “family have a new stepdad, but he’s black”. That was all it took to get the program off and running. The first impression was how Noah’s presence seems a lot more polished and sleeker than his often times delightfully bumbling predecessor. His infectious charisma coupled with impossibly refined good looks definitely makes it easy to accommodate whatever’s on the menu. There is no doubt that the lovely astute host benefits from the framework of excellence that requires impeccable comedic timing, which is connected by the fibers of an outstanding production that hinges on a level of writing that is hard to duplicate and easy to revere. All the most popular host in America had to do was own the spot he earned and prove that even better days are ahead. Nobody who tuned in can deny that Noah rose to the occasion with showman capability. He covered the gamut when it came to filtering through the landscape of blazing headlines. From inserts of political gab to the current racial climate suffocating the nation – there was enough material to satisfy our palette for whimsical consumption. Nevertheless it was victoriously brilliant first outing for Noah, who also shared the spotlight with the guest of the night, Kevin Hart. The comedian and actor was the perfect entrée as he complimented the show’s energetic tempo by supplying loads of laughter that must have been a welcome reprieve for the man who has been bequeathed with the uncanny job of reassuring viewers that he will earn our trust and devotion sooner rather than later. If Tuesday night was a test, then Noah passed with flying colors. His confidence was palatable and there was no question based on his body language and smooth delivery that he is the perfect choice for the task of propelling The Daily Show to the next frontier. And the best part is that he knows it.